A new study comparing wild, captive and working elephants has found that living in zoos can significantly shorten the animals' lives. Writing in the journal Science, researchers say obesity is a major cause of death in adult zoo elephants. They also cite stress as the key factor in the death of young captive animals when they are moved from zoo to zoo. They say ideally zoos should not take on new elephants if they cannot provide suitable environments. 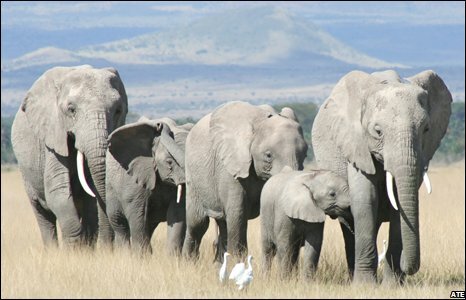 The study focused on the lives of female elephants, comparing more than 4,500 individuals. The researchers looked at wild elephants in Kenya's Ambosseli National Park, working elephants in the Burmese logging industry, and zoo elephant populations in Europe. For African elephants, the average lifespan in captivity was only 19 years compared with 56 years in the wild. Rates of mortality amongst zoo-born Asian elephants were two to three times higher than for those born in the logging camps. Ros Clubb from Britain's Royal Society for the Prevention of Cruelty to Animals (RSPCA) says diet and lifestyle are the key factors influencing elephant lifespan in zoos. "The vast majority are overweight in zoos, this could explain the high still-birth rates and why they're dying early. Bigger mothers have bigger calves and more of these are still-born," she said. Early death was also more likely to occur in captive animals born in the wild or transferred between zoos. Dr Clubb says this is probably caused by the stress of being taken away from their herd, mothers or family group. "In the wild they live in large stable groups, separation does cause stress; we know this from studies of other species," she said. Khyune Mar, now at the Department of Animal and Plant Sciences at Sheffield University, used to work for Myanma Timber Enterprise, the commercial arm of Burma's forest ministry. 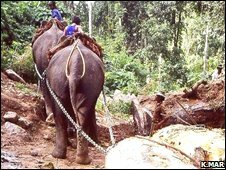 The company uses elephants to haul logs from the forests. Analysis of the lives of these working Asian elephants was based on data Dr Mar collected in Burma. 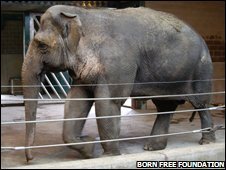 She says their longer life expectancy - more than 40 years compared with less than 19 in zoo elephants - can be put down to their lifestyle; for half the time the Burmese working elephants are allowed to act naturally. "We keep working elephants in the workforce for no more than six to eight hours a day. For the remaining hours we let them loose in the forest, they live like wild elephants, they can meet and mate with wild elephants, they have a full elephant life, good exercise and good food," she said. Dr Mar says there are lessons from the treatment of these working elephants that could be taken on board by zoos. "They have a very monotonous lifestyle, every day is the same for zoo elephants, they have to live in the same compound, with limited roaming, this makes them more stressed," she said. "They need a huge home range, more systematic enrichment, bigger compounds, grooming areas, mud wallows, hills." She says its important to allow them the freedom to behave naturally and has a straightforward message for zoos. "If the zoo does not have space, its simple - don't take elephants." The report's authors say transfers of elephants between zoos should be avoided, calves should be kept with their mothers for as long as possible to avoid stress-related death, and there should be regular screening for signs of obesity. A separate study looking in detail at all the elephants in UK zoos has found significant health problems and evidence of widespread psychological distress. Researchers from Bristol University studied 77 animals in 13 zoos and found that almost half of the elephants displayed abnormal behaviour. This included repeatedly swaying the trunk, pacing backwards and forwards and retracing their steps over and over again. "Some of the animals were born in the zoos and must have developed it there," said Chris Sherwin, from Bristol University's Department of Veterinary Science. "It's possibly their way of coping with stress, but almost certainly indicates they're in an environment which is inappropriate for their needs. This is not behaviour you see in the wild." The report says unless the animals' health and psychological suffering can be addressed, the ethics of keeping elephants in zoos must be questioned. "In my opinion, given the correct housing and care it would be ethically acceptable to keep a few elephants in a few zoos, but certainly not the numbers we have in all the zoos we have now," Dr Sherwin added. The Zoos Forum, the UK government's independent advisers on zoos, will consider the new findings and report to the Department of Environment, Food and Rural Affairs (Defra) within six months.